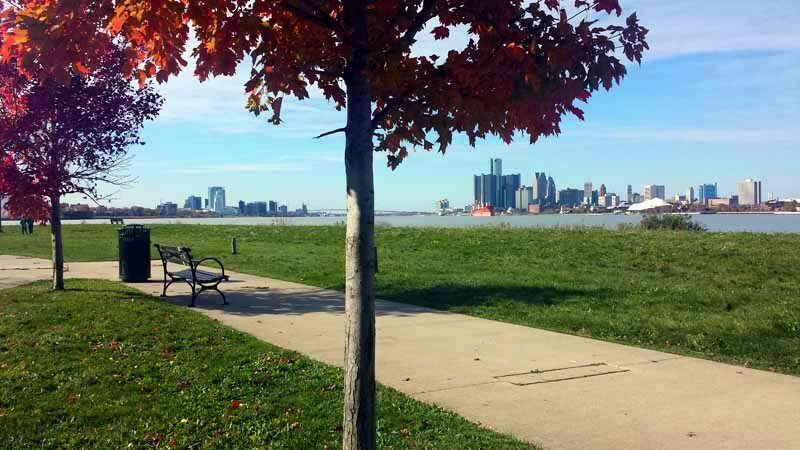 Ontario: Hanging along the Windsor Riverwalk. 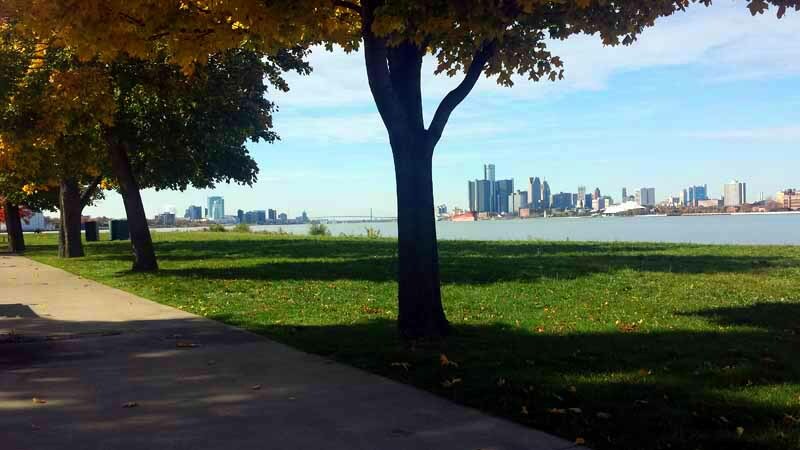 Recently I was passing through Windsor, Ontario, Canada and I decided to checkout a different part of their Riverwalk (riverfront) then I had seen before. 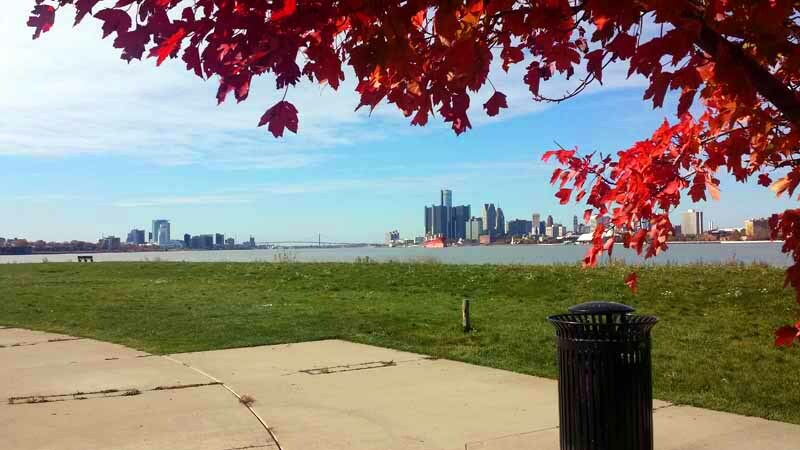 The Riverwalk sits along the Detroit River with the skyline and city of Detroit opposite, not to mention a different country, the United States. On this day I stopped at the part of the five kilometer park near Walkerville. 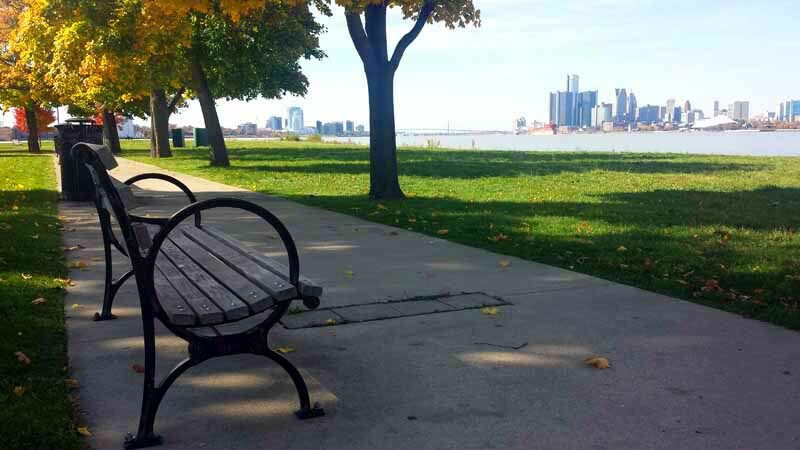 Many scenic and romantic park benches along with two city skyline views and a bike path going in-between. What can beat sitting on a park bench in one country, looking at the beauty of another?! A little further down the riverwalk around Ouellette Avenue and the main drag of Windsor is Piazza Udine. You’ll find lots of greenery and gardens alongside the park benches and Riverfront Trail. 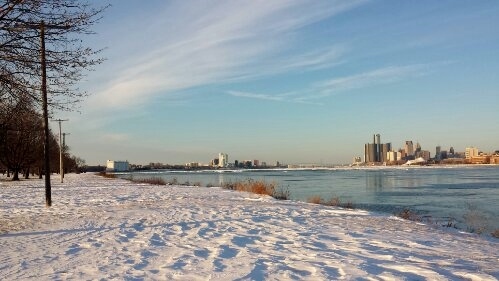 It was fun-filled sunny afternoon hanging along the Windsor riverfront. You can check out my time at other parts of the Windsor riverfront in The hidden gem across the river. 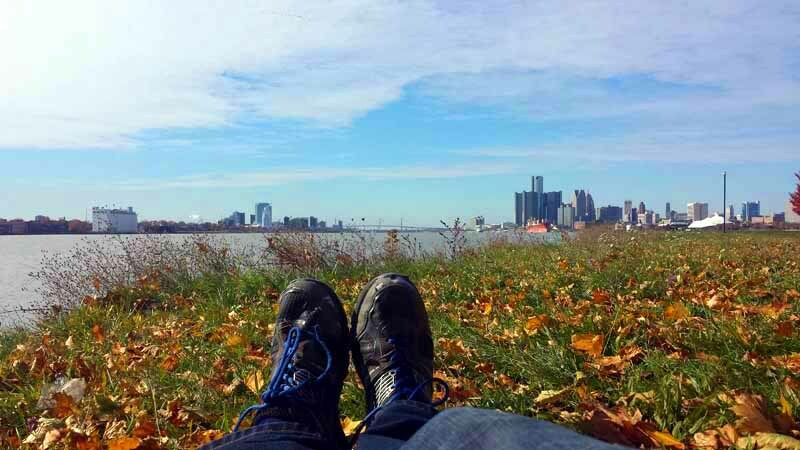 Windsor..
Two countries… two skylines… one shot… from Detroit! 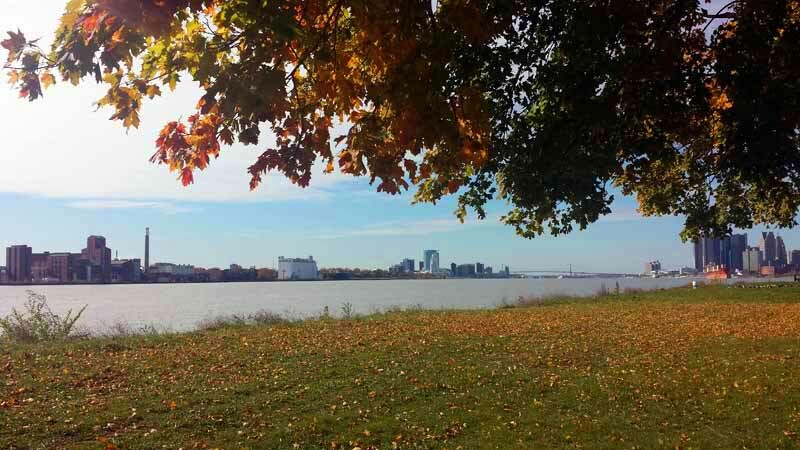 Just drive the MacArthur Bridge from Jefferson Avenue onto Belle Isle Park. 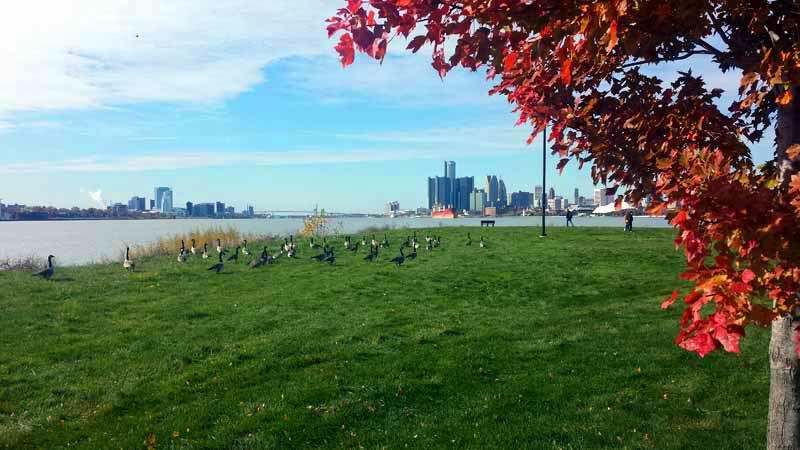 It’s an island park that sits in the middle of the Detroit River. 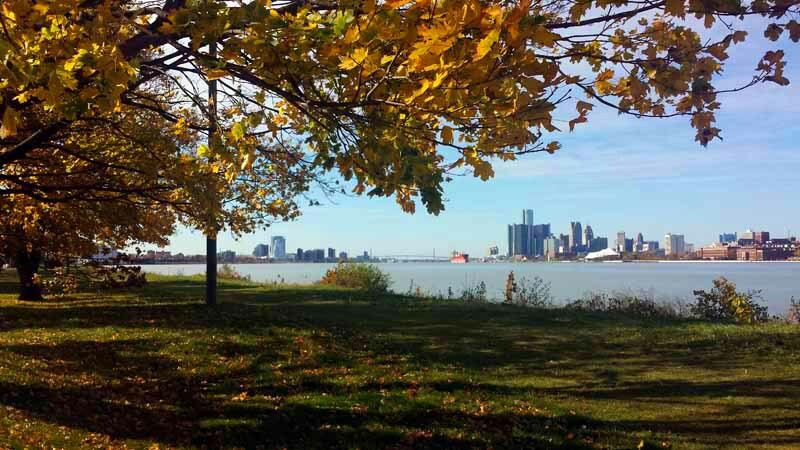 Upon entering on the main one way road that circles the park, you’ll head towards the southwest and you’ll see to the right the Detroit skyline. 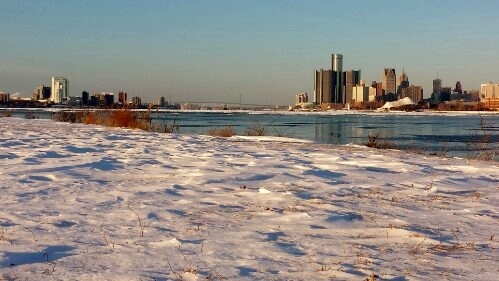 The tallest building is the GM Renaissance Center. There you have the United States. 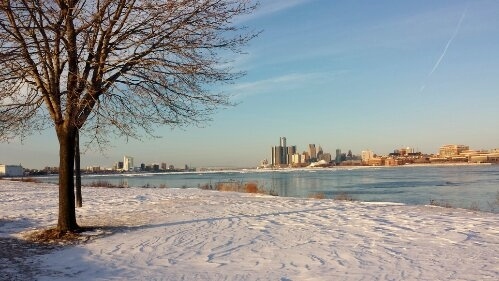 Look towards the left from the same vantage point and you got the Windsor, Ontario skyline. 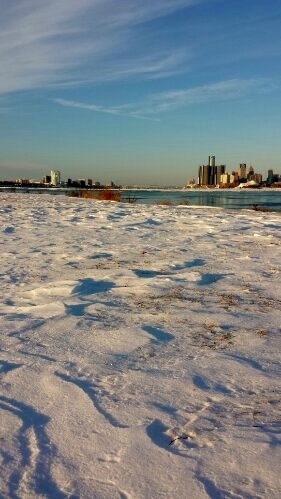 The white building, Caesars Windsor Hotel & Casino, is what dominates. You have country number two, Canada! At the tip you have nothing but the open water in front of you now too. Just lay down on the grass and soak in the flowers and the view. 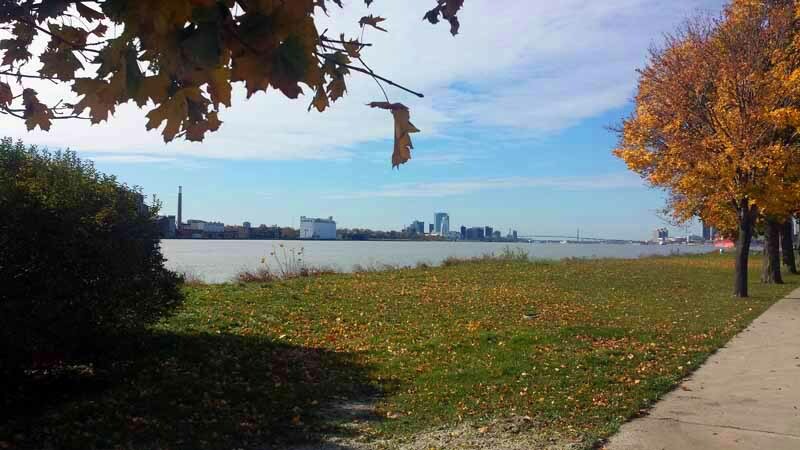 In all the photos, off in the distance is the Ambassador Bridge which connects the two cities and countries. Has anyone in their travels captured two skylines in one shot? What’s your favorite spot to just relax and chill with the open water in front of you? Ontario: A Canadian Club Whiskey Love Affair is Born. Over time I’ve taken a liking to whiskey. Whether it be an Irish Whiskey at Buena Vista in San Francisco, a shot of Jamison at the local bar or grabbing a Jack and Coke or two before a flight, I enjoy the flavor, after taste and there is something relaxing about it. I had the chance on a recent afternoon to visit a brand of whiskey with which I wasn’t that familiar, C. C. Canadian Club. I secured a free pass and toured one of the more well-known and historical makers of spirits and whiskey. Canadian Club headquarters and distillery are in Windsor (Walkerville), Ontario, Canada. Each room we toured was full of so much history and the tour guide did a great job describing since the beginning everything that has made Canadian Club what it is today. They were founded in 1858 by Hiram Walker. They produce whiskey for over 150 countries from all over the world, with different labels, styles of bottles, proof levels and drinks to fit the culture and rules of each. For example in Australia and New Zealand you can buy Canadian Club Dry pre-made, mixed with ginger ale or coca-cola in a four-pack. They had an enclosed display case with samples of the products they sell in various countries. The original Canadian Club bottle shown below is displayed in Hiram’s original office. Originally called Club Whiskey, it became wildly popular in the United States and started to hinder state-wide sales. As a result, as legend says, in the late 1800’s the US government forced them and all to put the country of origin on their bottles, thus Canadian Club was born. The government thought this would hurt their popularity in the states, boy were they wrong! Around the same time the town of Walkerville was founded by Hiram Walker. It was home to the workers of the distillery. The neighborhood has since been rolled into Windsor. Prohibition hit the United States in 1920 and for thirteen years it was illegal to manufacture, sell or consume beveraged alcohol. This wasn’t the case in Canada. In the basement is a meeting room shown below where business is conducted quietly and privately. The speakeasy they call it. Canadian Club was the largest distiller and most popular brand at that time, thus gangsters conducted business in the speakeasy regularly. Smuggling took place on the Great Lakes and the Detroit River. Numerous techniques were used to try to get across undetected. Driving across at night in the winter for instance. People dropped bottles in the river and later tried to retrieve them. Failed attempts resulted in bottles hitting the rivers floor. 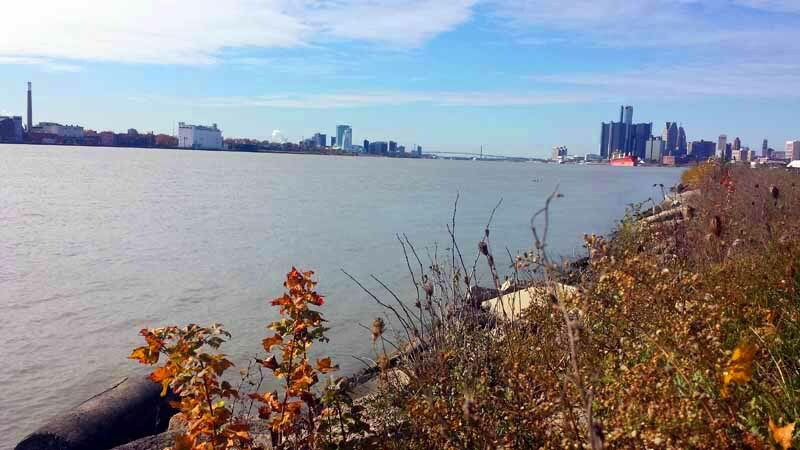 There are thought to be thousands of bottles at the bottom of the Detroit River today. A famous smuggler, Bill McCoy helped get Canadian Club into the states. There were lot’s of counterfeiters at that time. but Bill McCoy sold the real stuff. When customers were looking for the real stuff, the term “The Real McCoy” came about. Canadian Club Dock #57 – a full, rounded and fruity taste. 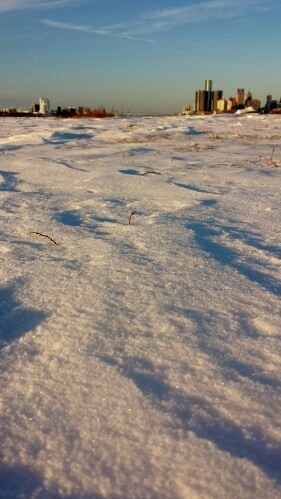 My favorite. 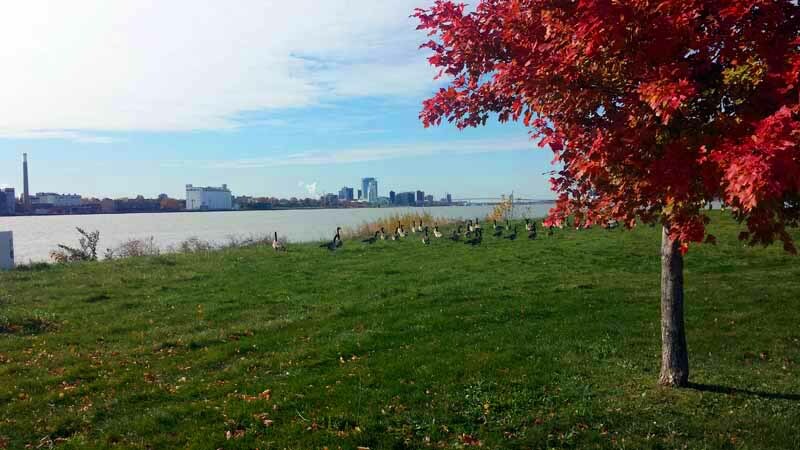 In the backyard of the facility is a beautiful garden and the aforementioned Detroit River. A wedding was going on along the shoreline with the magnificent backdrop. I noticed that Hiram’s office was on the opposite side of the building from the river. I learned this was because he wanted to focus on the task at hand and not be distracted by scenery. Great times at Canadian Club. Soon after the tour the whiskey and I ran into each other on an Amtrak train in the Midwest. …and at a local establishment. Any memorable distillery or brewery tours you would recommend from your travels? What’s your favorite kind of whiskey and do you like it straight or in a mixed drink?